This is Down On The Street Bonus Edition, where we check out interesting street-parked cars located in places other than the Island That Rust Forgot. The Rambler American-based Renault Torino wasn't the only license-built foreign car built in Argentina back in the day. 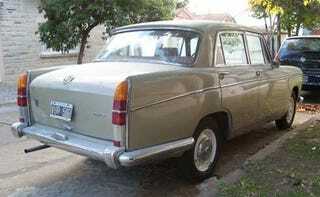 SIAM Di Tella made a deal with BMC to build the MG Magnette in Argentina, resulting in the Di Tella Magnette 1622. Daniel of has photographed this '66 down on the Buenos Aires street for us; he didn't provide a lot of details, but the car speaks for itself: 42 years old, British engineering, and still going strong!